Elian Herrera leaves Dodgers for Japan. Elian Herrera‘s return to the Dodgers organization was a short one. The Dodgers cut ties with the veteran utility man so that he can pursue work in Japan. He is reportedly signing with the Yokohoma DeNA BayStars. Herrera, 31, played 28 games for Triple-A Oklahoma City this season and slashed .218/.308/.238. Herrera played for the Milwaukee Brewers organization in 2014 and 2015 before re-signing with the Dodgers, who signed him as an amateur free agent out of the Dominican Republic in 2003 and employed him for 11 seasons. Herrera debuted with the Dodgers in 2012, batted .251, and played six different positions in 71 games with Los Angeles from 2012-13. 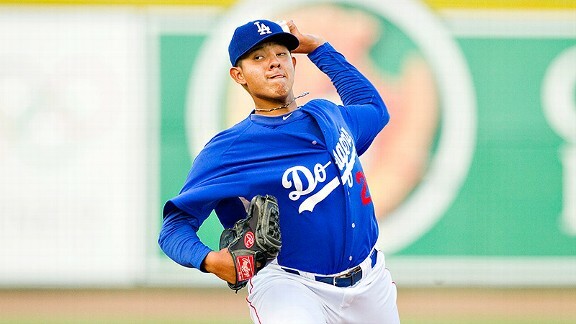 The Dodgers invited Herrera to spring training this year as a non-roster player. Elian Herrera returns to Dodgers. Elian Herrera has re-signed with the Dodgers on a minor league contract with a non-roster invitation to spring training. Signed by the Dodgers as an amateur free agent out of the Dominican Republic in 2003, Herrera reached the majors with the Dodgers in 2012. He spent two years shuttling back and forth to Triple-A as a utility infielder/outfielder. Herrera, 30, spent the last two seasons in the Milwaukee Brewers organization. He owns a career major league slash line of .250/.306/.360. Checking in on former Dodger Elian Herrera. Brewers manager Ron Roenicke was still gushing about the defense of his shortstop Friday, former Dodger Elian Herrera. In the seventh inning Herrera made a brilliant play to dive and catch a line drive by Matt Kemp, then shovel the ball to second base to double off Adrian Gonzalez. Herrera hasn’t made an error in 31 innings at shortstop. In fact, he hasn’t made an error at any of the six positions he’s played this season. Dodgers manager Don Mattingly didn’t use Herrera much at shortstop the last two seasons — just three innings total. Herrera saw more time at all three outfield positions, and second and third base, as a Dodger. As a result, Roenicke said he wasn’t really sure how Herrera would fare as Jean Segura‘s backup. Besides his defense, Herrera is batting .275/.292/.324 in 45 games this season. Daily Distractions: Red Patterson up, will start second game of doubleheader in MLB debut. Red Patterson‘s major-league debut will come in the second game of a doubleheader today against the Minnesota Twins. 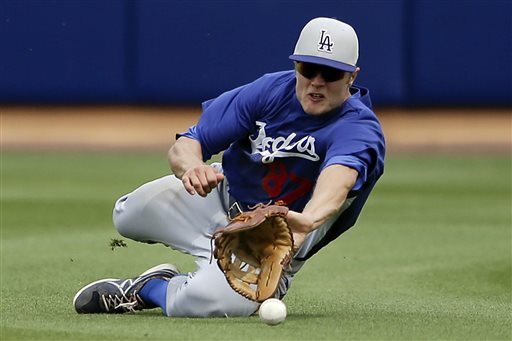 The Dodgers selected the contract of Patterson from Triple-A Albuquerque and designated Albuquerque outfielder Nick Buss for assignment. Patterson, who will wear No. 51, was added to the roster as the 26th man for today’s doubleheader. Major-league rules allow teams to dress 26 players in a day-night doubleheader that has been on the schedule for at least 24 hours. Patterson went 1-1 with a 4.15 ERA in four starts this season with the Isotopes, last pitching on April 24 at Fresno and allowing five runs on nine hits in 5.1 innings in a loss. The 26-year-old has gone 33-12 with a 3.40 ERA in 132 games (58 starts) in five minor league seasons after he was selected in the 29th round of the 2010 draft out of Southwestern Oklahoma State University. Patterson has 432 strikeouts, while walking only 148, in 440.0 career minor league innings. The Texas native made his first appearance in Major League camp this year as a non-roster invitee and allowed only one run in 11.2 innings (0.77 ERA), going 0-1 and limiting opponents to a .146 batting average (6-for-41). As for the name, shared by a longtime Dodgers PR director, it comes from his hair color. Patterson’s real first name is John. Buss, 27, had a .261/.330/.391 slash line in 26 games with Albuquerque. He was buried on an outfield depth chart that includes Matt Kemp, Carl Crawford, Andre Ethier, Yasiel Puig, Scott Van Slyke and Chone Figgins. Mike Baxter was designated for assignment in March. Buss went 2-for-19 after making his major-league debut with the Dodgers last September. Here are the lineups for both teams in Game 1. First pitch is scheduled for 10:10 a.m.